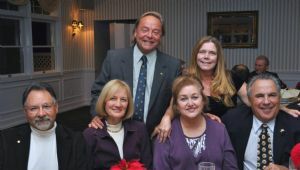 A Gift of Life Celebration Dinner was held on November 18, 2009 at the Bellport Country Club. The event recognized Dr. William Novick and the doctors from University Hospital at Stony Brook for their efforts to help children in need of cardiac treatment through the Gift of Life Program. Dr. Novick is the founder and medical director of the International Children's Heart Foundation (ICHF) based in Tennessee. Since its inception in 1993, he and his staff of volunteers have embarked on 198 medical missions, performing 4,000 life savings surgeries. Pictured are some of the Rocky Point Rotarians in attendance. For more photos from the event, go to the Gift of Life site page. During this past Rotary year, District 7260 Gift of Life Program sponsored four medical missions and treated 82 children in Honduras. District 7260 Gift of Life is planning additional missions including a mission to Haiti through the efforts of Past District Governor George Solomon.